It is almost a decade since graffiti artist Banksy’s painting of monkeys debating in place of MPs in the UK’s House of Commons emerged. The painting featured in the artist’s exhibition at the Bristol City Museum in 2009. Not exactly subtle, the image of monkeys replacing politicians is emblematic of the anonymous artist's dark humour. This week in the European Parliament, monkeys were the unlikely subject of debate by politicians. But there was no humour here in Strasbourg. Belgian MEP Kathleen Van Brempt captured it well when she told RTÉ: "You could laugh at it if it wasn’t so sad." So why were politicians engaged in a passionate debate about monkeys? A fortnight ago, The New York Times broke an incredible story. Just as the evidence built up about the harmful effects of diesel exhaust fumes on human health, scientists were conducting tests on monkeys in a US laboratory. Ten java monkeys were put into small airtight chambers for four hours at a time. They were left watching cartoons for entertainment as they inhaled fumes from a Volkswagen Beetle. German car makers had financed the experiment in an attempt to prove that modern diesel vehicles with the latest technology were cleaner than older engines. The organisation that commissioned the study was the European Research Group on Environment and Health in the Transport Sector, known by its German initials EUGT. It received funding from German car makers Volkswagen, BMW and Daimler. It was shut down last year. It has also come to light that 25 human volunteers were used in a study measuring the effects of nitrogen dioxide in Germany. The New York Times’ story has caused outrage in Germany. Volkswagen has suspended its chief lobbyist in response to the scandal. The latest controversy about the German car industry comes just two years after the Volkswagen admissions scandal or ‘Dieselgate’. The company admitted to fitting millions of cars with special software that allowed them to cheat emissions tests. This week, the European Parliament met for the first time since the ‘Monkeygate’ story emerged. Ms Van Brempt, the Belgian centre-left MEP who chaired the EU’s ‘Dieselgate’ inquiry, drew parallels between the current scandal and the tobacco industry in the past. "Remember when they paid for so-called independent research to say that there are no hazardous substances in cigarettes in the past?" she asked. She accused the German car manufacturers of aiming to undermine the work of legislators, while at the same time misleading consumers. 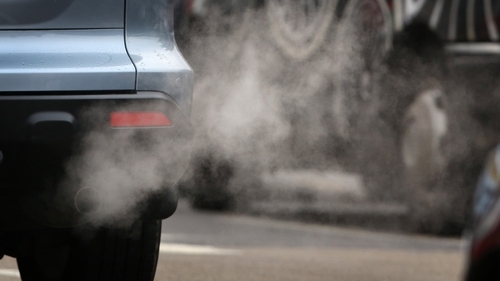 In 2012, the World Health Organisation said that it had found sufficient evidence that exposure to exhaust fumes from diesel engines is associated with an increased risk of cancer. This week, Sinn Féin MEP Lynn Boylan accused the car manufacturers of "doing everything in their power to reject the science that proves diesel are carcinogens and have been designated as such since 2012". Another Irish MEP Marian Harkin, of the liberal ALDE group, sits on the EU’s Employment and Social Affairs Committee. That committee is currently working on legislation to deal with the safety of workers from cancer causing substances or carcinogens. Diesel fumes, inhaled by workers in jobs such as unloading haulage trucks, are one of the substances included as carcinogens under review by that committee. There is a view that some car manufacturing giants believe they are "untouchable", above the law and "without morality". Ms Harkin believes her committee’s work demonstrates how MEPs can make a difference to ordinary workers. The European Parliament is a diverse place. Irish people may be taken aback to hear that there is a European political party called ‘The Party for the Animals’. Although it claims not to be a single issue party, the Dutch party does what it says on the tin. Its primary goals are animal rights and animal welfare. It currently has one MEP - Anja Hazekamp. Since ‘Monkeygate’, he’s been calling for the European Commission to open proceedings against the car manufacturer as the tests on humans and animals infringe EU law. A forlorn looking EU’s industry Commissioner Elżbieta Bieńkowska told parliament this week that "without the car industry taking responsibility and admitting that what they are doing is immoral" it is difficult for legislators to tackle the manufacturers’ practices. It may be almost a decade since Banksy’s ‘Monkey Parliament’ painting emerged. His critics might call the image of monkeys replacing politicians as crude and blunt. This week, Independent MEP Luke Ming Flanagan said that before making laws politicians need to have confidence that independent research is really independent. He warned there is "a culture of deceit in private industry" - a blunt message from a politician. But on the evidence that has emerged recently, many might agree that he makes a valid point.